So this morning started like any regular Monday. I awoke slightly annoyed at my need to be awake, and too tired to properly function. Groggily, shuffling around the house, getting ready for work and then finally leaving. The morning progressed as my usual work day does, until I started checking Twitter for #minaturemonday images. That's when I stumbled across a post by @evilkipper, aka Warboss Rob. Question 1, #Warmongers! Would you be willing to donate and/or paint 40K units for a #WAAC army raffle? Probably Salamanders. I remember last year, a bunch of the British #warmongers on Twitter were talking about #WAAC and they held something like a 24 hour gaming day and painting marathon. I didn't know what was going on, really, but it seemed like a nice idea and it got a lot of attention from the community. It was especially nice to see a group of like minded gamers joining forces under a single banner. Now, this is actually a charity event for the UK. But after seeing Rob's post and a bit of thinking on it, I decided to throw my hat in on it as well. For the most part, because in the last year these same folks have been super kind and supportive of my own hobby efforts that I kind of feel like I'm one of them. And seeing as the #warmongers span the globe, even though I've never tossed dice in a single game of Warhammer or 40k or met a single one of them. I felt it would be good thing to help out on and decided that I needed to participate. Rob was worried about the shipping cost involved in getting my donation across the pond. But I did some searching and found that for a 1lb item, it's not really SUPER horrible. And just chalked it up to part of my donation. The biggest problem, in my mind, was I wasn't sure what to donate (due to my utter lack of army building knowledge). After a few DMs with Rob about it, he suggested either Devastator Squad or a Dreadnought to round out the current list. 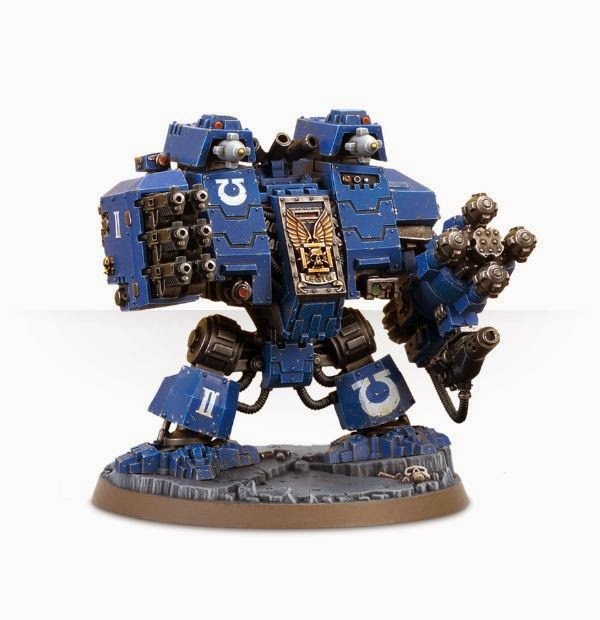 I'm a huge fan of Dreadnoughts, and don't really like squad painting. So, I went with the Ironclad Dreadnought! This guy is so much cooler than the standard Dreadnought, and I've always wanted to paint one up. 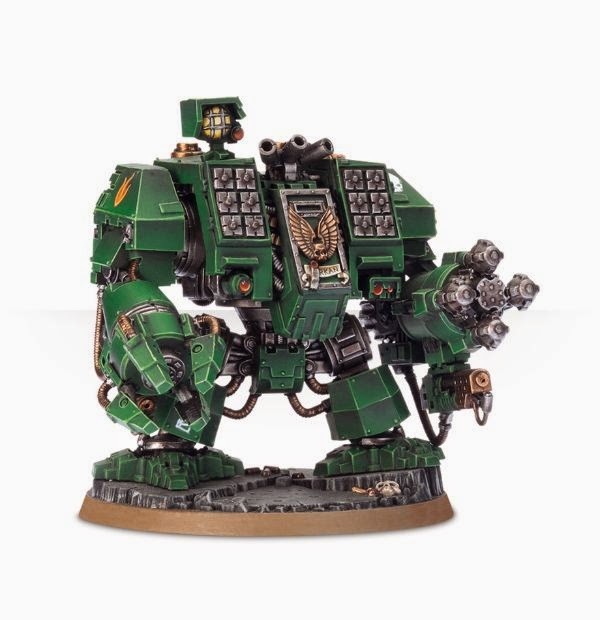 He's a freaking beast and should look super awesome in the Salamanders' colors! I am also going to make it a point to paint ever possible piece and may even look into magnetizing certain parts as well. So far the goal is for everyone involved to either donate a unit of some kind, paint a donated unit or donate a fully painted unit (That's a lot of units!). Then, later this year (it's looking like July), Rob will hold a raffle for the entire army and the proceeds will go towards McMillan Cancer Support. So not only does someone end up getting a full Salamanders army, it's all going towards a good cause as well. Now, the only kicker is, the whole thing is base in the UK. So I'm not sure if they are going to allow raffle entries outside of the country. I believe it will end up being limited to UK only, due to the extremely high shipping costs of sending such a large package. Either way, it's totally fine. I am joining in this for the fun of doing something as part of the community and giving back to it. Anyway, that's it from me for now. 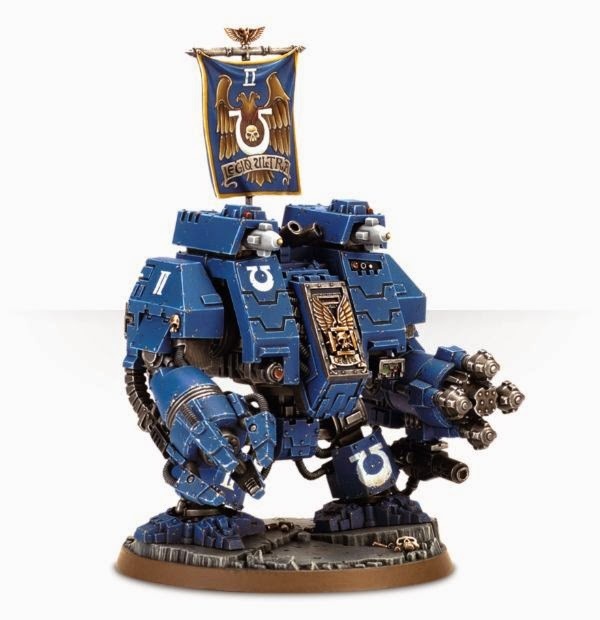 I'm hoping to get the Ironclad Dreadnought ordered next weekend. Then I can start work on it when it arrives. I'll need to hop on it asap, so I can get it in the mail well ahead of time, to account for overseas shipping.